Temescal Peak is the highest peak in Topanga State Park, the largest state park in the Santa Monica Mountains and located within the city limits of Los Angeles. Topanga State Park is easily accessible from many directions and criss-crossed by a well-maintained network of trails. 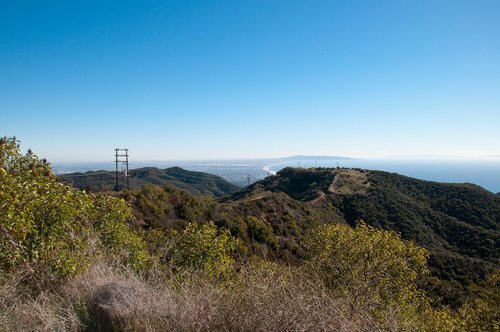 Although Temescal Peak certainly does not qualify as a “difficult” peak by any standards, the views from the top are unobstructed and far-reaching on clear days. Although the peak is not difficult, there are many different trails that can be taken to reach the summit. You can “design” easy to challenging routes that would require a long day. The trails in Topanga State Park are usually very popular with hikers, trail-runners, mountain bikers, and horse-back riders. Most likely you won’t be by yourself on this hike. There are generally two main approaches to reach the peak: from the Trippet Ranch Trailhead to the west or from the south via the Temescal Fireroad. Trippet Ranch: You can reach Trippet Ranch via the Topanga Canyon Boulevard. There are many trails originating from the former Gentlemen Ranch. You can take either the fire road along the ridge or the Musch Ranch Trail towards Eagle Junction. From that junction you can use the “high road” to Eagle Rock and further to “The Hub” or you can take the “Low Road”, which leads more directly to a junction, at which three fire roads intersect (The Hub). From there you take the fire road south, which is called Temescal Canyon Road at this point. Temescal Fireroad: You can access the Temescal Fireroad from the south via the Temescal Gateway Park off Sunset Boulevard in Pacific Palisades. Or you can intersect the Temescal Fireroad from Pacific Highlands above Skull Rock. You can get to the trailhead in Palisades Highlands via Palisades Drive off Sunset Boulevard. Drive carefully and follow the signs to the trailhead. The neighborhood (Palisades Highlands) you are driving through is a very upscale, luxurious residential area with multi-million dollar homes. In either case you will be approaching Temescal Peak from the south via the fireroad along the ridge separating Santa Ynez Canyon to the west from Temescal Canyon to the east. Temescal Peak: From either the west (Trippet Ranch) or the south you will approach Temescal Peak via the Temescal Canyon Road. There is no maintained trail going to the summit, but many well-worn use trails have formed mostly from the south. Leave the fireroad at any spot that looks reasonable to you and hike steeply on one of the use trails to the small summit. There is a short pole with a register and a benchmark on the summit. Enjoy the views, which range from the Los Padres National Forest to the north, the San Gabriel Mountains to the east (sometime even San Jacinto on an exceptionally clear day), the Pacific Ocean with Catalina Island to the south, and more of the Santa Monica Mountains to the east (maybe even one of the Channel Islands). The peak (“Divide” on the benchmark) separates the watersheds of Santa Ynez, Temescal, and Upper Rustic Canyons. Pick your route of choice to return.